The Golden Bull of 1356 was a decree issued by the Imperial Diet at Nuremberg and Metz (Diet of Metz (1356/57)) headed by the Emperor Charles IV which fixed, for a period of more than four hundred years, important aspects of the constitutional structure of the Holy Roman Empire. It was named the Golden Bull for the golden seal it carried. According to the written text of the Golden Bull of 1356: We have promulgated, decreed and recommended for ratification the subjoined laws for the purpose of cherishing unity among the Electors, and of bringing about a unanimous election, and of closing all approach to the aforesaid detestable discord and to the various dangers which arise from it. Though the election of the King of the Romans by the chief ecclesiastical and secular princes of the Holy Roman Empire was well established, disagreements about the process and papal involvement had repeatedly resulted in controversies, most recently in 1314 when Louis of Bavaria and Frederick of Austria had been elected by opposing sets of electors. Louis, who had eventually subdued his rival's claim on the battlefield, made a first attempt to clarify the process in the Declaration of Rhense of 1338, which renounced any papal involvement and had restricted the right to choose a new king to the prince-electors. The Golden Bull, promulgated by Louis's successor and rival, Charles IV, was more precise in several ways. Firstly, the Bull explicitly named the seven Prince-electors (Kurfürsten) who were to choose the King and also defined the Reichserzämter, their (largely ceremonial) offices at court: Ecclesiastical Princes: Archbishop of Mainz, Archchancellor of Germany, Archbishop of Cologne, Archchancellor of Italy, Archbishop of Trier, Archchancellor of Burgundy. Secular Princes: King of Bohemia - Arch-Cupbearer, Count palatine of the Rhine - Arch-Steward, Duke of Saxony-Wittenberg - Arch-Marshal, Margrave of Brandenburg - Arch-Chamberlain. 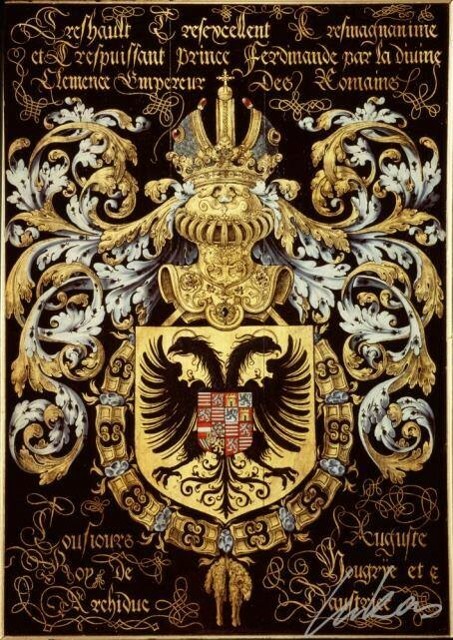 The House of Wittelsbach ruled the Duchy of Bavaria as well as the County Palatinate. Dynastic divisions had caused the two territories to devolve upon distinct branches of the house. 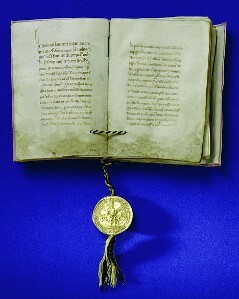 The Treaty of Pavia, which in 1329 restored the Palatinate branch, stipulated that Bavaria and the Palatinate would alternate in future elections but the Golden Bull fixed the electoral vote upon the Palatinate and not upon Bavaria, partly because Charles's predecessor and rival, Louis IV was of that branch. Louis IV's sons, Louis V and Stephen II of Bavaria, protested this omission, feeling that Bavaria, one of the original duchies of the realm and their family's chief territory for over 170 years, deserved primacy over the Palatinate. 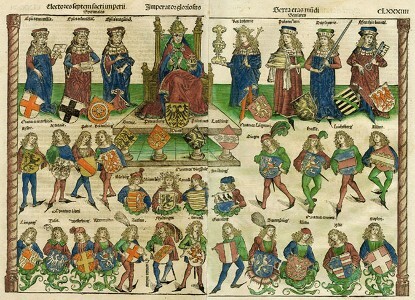 The omission of Bavaria from the list of prince-electors also allowed Bavaria, which had only recently been reunited, to fall into dynastic fragmentation again. Brandenburg was in the hands of the Bavarian Wittelsbachs (though held by a junior member of the house) in 1356, they eventually lost the territory to the Luxemburgs in 1373, leaving the Bavarian branch without representation on the Electoral college until 1623. The House of Habsburg, long-time rivals of the Luxembourgs, were completely omitted from the list of prince-electors, leading to decreased political influence and dynastic fragmentation. 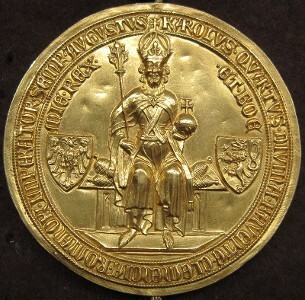 In retaliation, Duke Rudolf IV, one of the dukes of fragmented Austria, had the Privilegium Maius forged, a document supposedly issued by Emperor Frederick Barbarossa. The document gave Austria - elevated to the position of an Archduchy - special privileges, including primogeniture. While ignored by the Emperor and other princes at the time, the document was eventually ratified when Frederick of Austria himself became Emperor in the 15th century. Still, the Habsburgs remained without an electoral vote until they succeeded to the Kingdom of Bohemia in 1526. Quod si facere distulerint infra triginta dies, a die prestiti juramenti prefati continuo numerandos, extunc transactis eisdem triginta diebus amodo panem manducent et aquam et nullatenus civitatem exeant antedictam, nisi prius per ipsos vel majorem partem ipsorum rector seu temporale caput fidelium electum fuerit, ut prefertur. [Translation:] But if they shall fail to do this within thirty days, counting continuously from the day when they took the aforesaid oath: when those thirty days are over, from that time on they shall live on bread and water, and by no means leave the aforesaid city [Frankfurt] unless first through them, or the majority of them, a ruler or temporal head of the faithful shall have been elected, as was said before.— Chapter 2, §3. Besides regulating the election process, the chapters of the Golden Bull contained many minor decrees. For instance, it also defined the order of marching when the emperor was present, both with and without his insignia. A relatively major decision was made in chapter 15, where Charles IV outlawed any conjurationes, confederationes, and conspirationes, meaning in particular the city alliances (Städtebünde), but also other communal leagues that had sprung up through the communal movement in mediaeval Europe. Most Städtebünde were subsequently dissolved, sometimes forcibly, and where refounded, their political influence was much reduced. Thus the Golden Bull also strengthened the nobility in general to the detriment of the cities. The pope's involvement with the Golden Bull of 1356 was basically nonexistent, which was significant in the history of relations between the popes and the emperors. 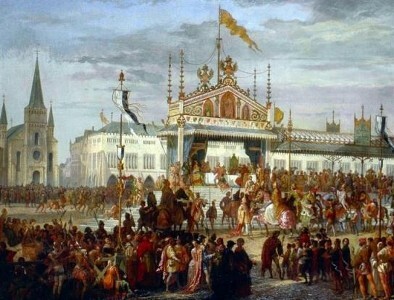 When Charles IV laid down procedure for electing a King of the Romans, he mentioned nothing about receiving papal confirmation of the election. However, Pope Innocent VI did not protest this because he needed Charles’s support against the Visconti. Pope Innocent continued to have good relations with Charles IV after the Golden Bull of 1356 until the Pope's death in 1362.